One of the religions that features most prominently in Tock’s life is the worship of Anosmia, the Gnomish Goddess of Destruction (Bumble’s family works with Her at least occasionally, as indicated here). 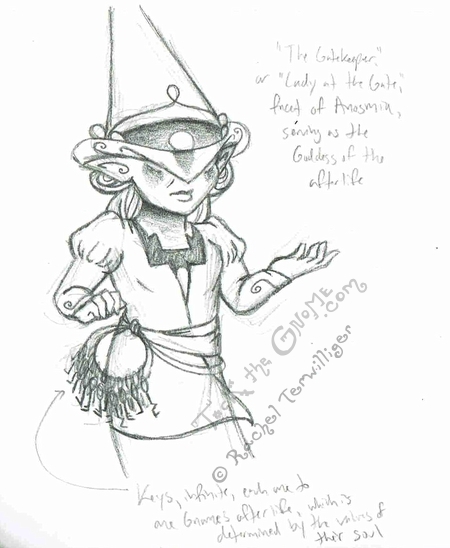 Anosmia has a lot of features and roles, and in this sketch, appears as a Guardian of the afterlife – guiding Gnomish souls from the physical world to the beyond. Which would indicate that in general, Gnomes belief in a world beyond after death that signifies eternal rest and may include reincarnation and/or punishment, depending on the value of their soul and what gods they served in life, etc. More on part of the Gnomish pantheon here. All content © Rachel Terwilliger. Do not use, alter or redistribute without permission.